The Borders Railway established a passenger rail link from Edinburgh to Tweedbank for the first time in more than 40 years. The £294 million project consisted of 30 miles of new passenger railway, plus seven new stations and 160 structures. The scheme was delivered by Network Rail and was commissioned by Transport Scotland in a bid to stimulate more economic development from the Scottish Borders and Midlothian to Edinburgh and beyond. Alter Landscapes Limited, an experienced fencing installer based in Renfrewshire, was tasked with installing a fencing solution, spanning more than 19,000 metres, which would deter route crime along the new railway. Network Rail specified a Class 2 solution for use on this project. 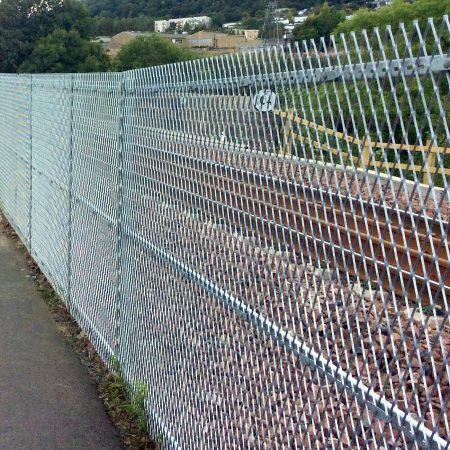 The ExMesh™ team supplied a Fastrack security fencing system that was implemented along the new 30-mile railway. Fastrack was developed in conjunction with the rail industry as a secure alternative to palisade or chain link fencing systems, and it is ideal for use in areas with restricted access as it is easy to install and maintenance-free. It can also be used on sloping ground without stepping. Fastrack is Network Rail approved, Class 1 and Class 2.